With the reintroduction of the SHIELD Act last month, all eyes are once again focusing on patent holding companies and their effects on innovation. The increased litigious atmosphere in the wireless, internet, consumer electronics, and software industries has created opportunities for patent holding companies to create business models that rely solely on generating revenue from licensing and litigation activities. These companies are also known as “patent trolls”, “non-practicing entities” (NPEs) or “patent assertion entities” (PAEs). Nomenclature aside, a number of these entities operate as successful, lucrative, publicly-traded companies – no small feat for a group that is referred to as “tech’s parasites” (and probably much worse). While there has been much debate on the value, nuisance, and ethics surrounding patent holding companies, Envision IP reviewed the stock performance of various publicly traded companies in this space to understand how this niche industry has fared compared to the broader market. Our purpose is not to weigh in on the ethics of these entities, but rather to empirically focus on their business model. In our analysis, one pattern is certainly clear – these entities live, and die, by each specific patent litigation case. Balance sheets show exceptionally high costs for litigation. In years where no jury decision or settlement is reached, these companies often report negative net income in the tens of millions. However, when a favorable outcome is obtained, a company’s stock price can easily double or triple. Our analysis includes the following companies: Acacia Research Group (ACTG), Asure Software Inc. (ASUR), Network-1 Security Solutions Inc. (NSSI), Opti Inc. (OPTI). Rambus Inc. (RMBS), VirnetX Holding Corp. (VHC), Vringo Inc. (VRNG), Universal Display Corp. (PANL), Document Security Systems Inc. (DSS), Worlds Inc. (WDDD), Democrasoft Inc. (DEMO), Pendrell Corporation (PCO), Parkervision Inc. (PRKR), and Unwired Planet Inc. (UPIP). The year-to-year gains and losses for these companies fluctuated widely, which is not surprising given that patent litigation is very specific to each case, company, product, and patent. Thus, it is difficult, if not impossible, to correlate one company’s success as an indicator for another company’s patent monetization efforts. From 2008 through 2012, the S&P 500 has produced a total return of 15.26%. As a whole, the group of 14 companies above returned a combined return of 33.85% during this same period. However, only half of the 14 companies we analyzed had an overall positive return, with 2 of these companies showing triple digit returns, and five companies exhibiting double digit negative declines. VirnetX had a total return of 334.27% from 2008 to 2012. 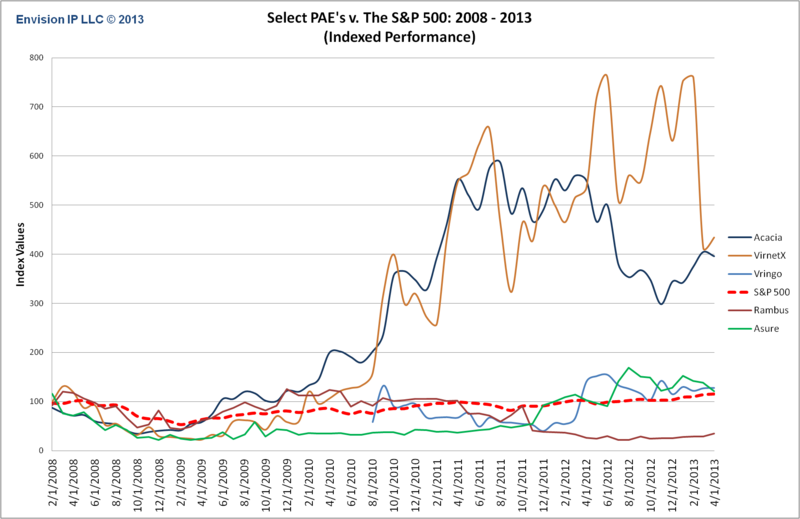 The stock performance has been quite volatile, with a -70% return in 2008, 97.8% in 2009, and 448% in 2010. The percent returns, while impressive, have been declining in recent years, with a 68% return in 2011, and a 17.2% return in 2012. To date in 2013, VirnetX has returned -31.2% for investors. In 2010, VirnetX obtained a $200 million settlement from Microsoft after winning a jury verdict related to virtual private network technology. The company was also awarded $368 million in damages from Apple in November 2012. Yet, as a sign of the high volatility in this industry, just last month VirnetX lost a case against Cisco. That decision dropped VirnetX’s share price by almost 30%, leading to an immediate market cap loss of over $500 million. Acacia Research Group had a total return of 296.24% from 2008 to 2012. As with VirnetX, Acacia has experienced significant volatility during this period, with a -60% return in 2008 swinging to a 200% return in 2009. The yearly return dropped from 184% in 2010 to 41% in 2011, and subsequently fell to -30% in 2012. To date in 2013, Acacia Research Group has returned 15%. Other positive, double-digit performers during 2008 to 2012 include Universal Display Corp. (93.01); Vringo (27.60%); Unwired Planet (25.12%); Asure Software (20.87%); and Network-1 Security Solutions (16.54%). While the companies beating the S&P 500 did so in an impressive fashion, the companies that lagged behind the S&P 500 did so with high double digit losses, with the exceptions of Unwired Planet (-0.97%) and Opti Inc. (-7.69%). 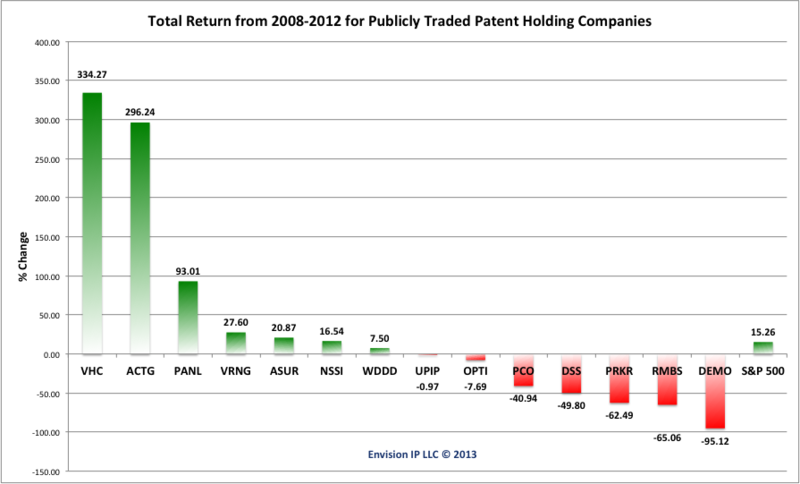 As a group, publicly-traded patent holding companies have provided investors with exceptional returns over the last five years. However, year-to-year volatility is extremely high for many of these companies, with double and triple digit swings. For example, Parkervision had a yearly return of 136% in 2012, and has already returned 104.92% year to date in 2013 for investors. However, from 2008 to 2010, the company had negative yearly returns of -77.28%, -25.91%, and -74.86%, respectively. Its rise in recent months may be attributed to a favorable Markman Order in its suit against Qualcomm, showing that individual court rulings can have tremendous impact on these stocks’ movements. With the increased scrutiny and negative sentiment in recent months surrounding patent holding companies, it will be interesting to see if the US government passes legislation and imposes regulations to limit the ability of non-practicing entities to enforce patents. For now, investors may cautiously hope for continued returns as there appears to be no slowdown in patent litigation, and specifically, in assertions by patent holding companies.